Hear the word "antenna" and you might think about rabbit ears on the top of an old TV or the wire that picks up radio signals for a car. But an antenna can be much smaller – even invisible. No matter its shape or size, an antenna is crucial for communication, transmitting and receiving radio signals between devices. As portable electronics become increasingly common, antennas must, too. Our materials science lab focuses on nanomaterials, which are more than 100,000 times thinner than a human hair. In 2011, researchers in the Drexel University Materials Science and Engineering Department developed a way to combine metals with carbon or nitrogen atoms to create a material that's a few atoms thick, very strong and good at conducting electricity. We call these materials MXenes (pronounced "maksens"), and we can make them with different metals – including titanium, molybdenum, vanadium and niobium. Our most recent work has identified that mixing MXenes with water lets us spray antennas on any surface, including a brick wall or a glass window – and even use an inkjet to print an antenna on paper. This creates new opportunities for smaller, lighter, more flexible antennas to accompany devices that are also being made from more varied and versatile materials. Smart watches and electronic car key fobs might seem advanced, but researchers are working on many more options, including hospital gowns that can sense patients' heart and breathing rates, and stitches that monitor healing after surgery. They'll need antennas too – which are sterile, flexible, strong and even machine-washable. How MXenes can shield electromagnetic radiation. Another type of antenna is making its way into the world, too. Many credit and debit cards, as well as U.S. passports, contain what are called RFID tags, tiny electronic chips that carry identifying information and transmit them to sensors that validate transactions or certify the identity of the document's carrier. RFID tags are even more commonly used in industry, tracking components in manufacturing processes, individual boxes and containers in large shipments and even controlling workers' access to specific areas of an office or factory. Since Drexel's 2011 discovery of MXenes, researchers around the world have been testing out how they work in a variety of tasks. Some early successes have included energy storage devices, electromagnetic interference shielding, water filtration, chemical sensing, structural reinforcement, cancer treatment and gas separation. All of these approaches take advantage of the physical and electrical properties of MXenes: They're transparent to light, electronically conductive, chemically stable and strong. 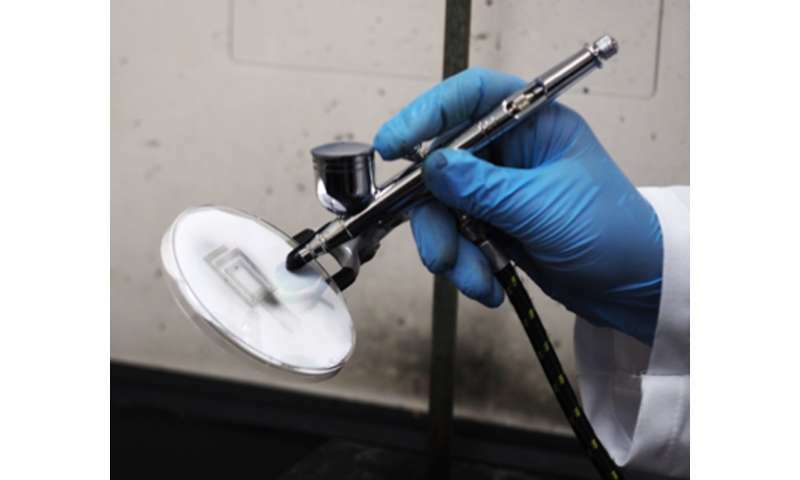 Spraying MXene antennas on surfaces. We have been exploring how to use another physical attribute MXenes have: They love water. When we mix sheets of two-dimensional titanium carbide MXene with water, we get a stable water-based ink. We can spray or print that ink on any surface, and when the water evaporates, what's left behind is layers of MXene – an MXene antenna. When we do this with a titanium carbide MXene, the resulting antenna is very good at transmitting and directing radio waves, even when it's applied in a very thin layer. Our initial testing suggests it can perform as well as more commonly used antennas made of gold, silver, copper or aluminum. And because it's so much thinner, an MXene antenna can be effective in spaces too small for other antenna materials – even as small as one-thousandth the thickness of a sheet of paper.